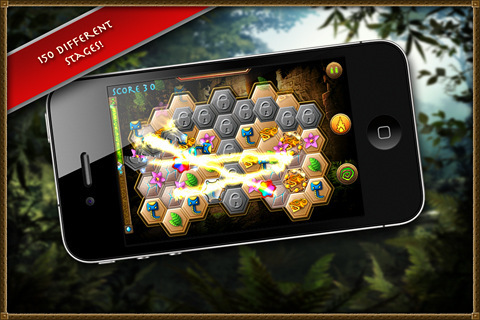 Last Temple by Ganymede is a puzzle game for the iPhone and iPod touch with an HD iPad version also available. You set out on a quest to become the champion of your people. You don’t do this by fighting dragons or saving villagers, but by mastering the scrolls of wisdom and collecting crystal skulls. Each scroll features twenty four levels. Every eighth level is the crystal skull level where you’ll fill a crystal skull up to collect it. There are three difficulty settings from easy to hard. Last Temple is like Connect Four but you need to connect three of the same icons to make the tiles turn from gold to blue. Clearing all the tiles will allow you to tap on falling rubies to collect them. You can connect more than three to increase your score. Combos can be done by continually connecting chains as fast as you can. Connecting six or more icons increases your time (left green bar) which when depleted result in a failed stage. It gets hectic as the amount of time for combos (upper red bar) is greatly shortened the higher the combo is. Doing this not only increases your score but increases your blue spell bar. You have two spells. The fireball spell shoots a fireball from the air down to a tile you select. The fireball spell can hit adjacent tiles but sometimes it can also be activated automatically to hit a random tile. The wind spell moves everything on the board and is activated automatically when you cannot connect any icons. The results screen shows you your score, number of rubies collected, your longest chain, your highest combo, and your total score for that level. Your total score also determines if you will get a bronze, silver, or gold medal. Last Temple has a tendency to add a new feature when you have gotten adjusted to a previous mechanic. There is a tile that needs to have a chain of icons to unlock it. A timer icon needs to wait a certain amount of time to unlock. The lightning icon will shoot light in a random path clearing some tiles or icons. Look out for separated boards which give you less chances to increase your score and clearing the boards. The dark stage has a small light that moves around so you have to remember the icons, but you can have more light by continually getting chains. Then there is the crystal skull level where you try to find chains of crystal skull icons. The soundtrack of Last Temple fits the atmosphere. It seems to get repetitive after a few levels. The sound effects range from clicking noise when selecting tiles, an explosion when dynamite goes off, and others. The music gets faster when you are running out of time which serves as a warning to finish the level soon. Music and sound effects can be adjusted, but the change a meter is hard to adjust. The audio is decent just not something new. 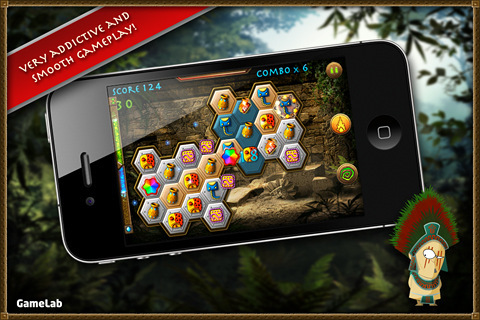 The levels can get difficult as you play but can be replayed as many times as you want to get high scores and medals. There are challenges that can be bought using the rubies you have collected. These challenges are quite difficult. One of them requiring you to finish the level with a low time. The graphics are very colorful, polished and crisp. The background can repeat but you’ll be busy connecting icons so it is not a big deal. Pixelation and lag are not problems for this app. Last Temple cost $0.99 and is a good puzzle game even though it can throw things at you when you least expect it. There are many mechanics to Last Temple that can make it amusing but sometimes frustrating. I find myself playing Last Temple from time to time when I get bored or want some amusing puzzles to solve. Sample the free version of Last Temple on your iPhone. AppSafari review of Last Temple was written by Tony Lau on February 16th, 2011 and categorized under App Store, Games, Puzzler. Page viewed 3885 times, 1 so far today. Need help on using these apps? Please read the Help Page.